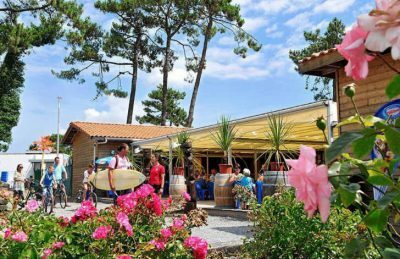 Campeole Plage Sud is a lovely 3 star campsite that is located in a stunning position between the forest and Biscarrosse Plage. The scented pine trees, hedgerows and fragrant flowers ensure that you not only benefit from some welcome shade and privacy but also that you have a really lovey atmosphere in which to spend your holiday. Everything that you could possibly want from a campsite in France is within walking distance of Campeole Plage Sud. The beach, shops, disco, banks, cafes, restaurants and more can all be reached within a few minutes by foot and obviously less by bicycle or car. We’ve already said that the beach is within walking distance but it’s certainly worth mentioning again as there are miles of sandy beach just a few hundred metres from Campeole Plage Sud. The soft sand is perfect for families of all ages and as well as the usual beach activities such as swimming, sunbathing and sandcastle building, you can also take part in some more adventurous water based activities including surfing. To compliment the rest of the activities and the beach, Campeole Plage Sud boasts a very nice swimming pool complex that features a great family pool, children’s swimming pool, water slides and also plenty of sun terrace for relaxing. On-site activities at Campeole Plage Sud include multisports field, football, basketball, volleyball, playground, bouncy castle, table tennis, boules and cycle hire. This pitch only campsite is perfect for campers with tents, caravans and / or motorhomes. Facilities include: WIFI, restaurant, takeaway, bar, pizzeria, bread service, games room, animation team, refrigerator rental, safe rental, washers, dryers, laundry sinks, washing up sinks, ironing facilities, washbasins, individual wash cabins, showers, standard toilets, family toilet facilities, baby room, children’s sanitary facilities and chemical toilet disposal points. The camping pitches at Campeole Plage Sud are around 70m to 90m2 in size with some of the pitches getting shade from the pine trees on-site. Click the button below to book a camping pitch at Campeole Plage Sud with our travel partner, Suncamp.